Award winning project by Shane Cook Designs. The Oxford Shipping container won first place by Paper City Magazine in 2013 for Best Use of Green/Sustainable Design. The pair or reclaimed shipping containers were set in the beautiful Heights historic district bungalow home. with a total size of 496 sqft the Oxford Shipping Container Home is another win for Shane Cook designs in the fields of interior architecture, adaptive reuse, and sustainability. 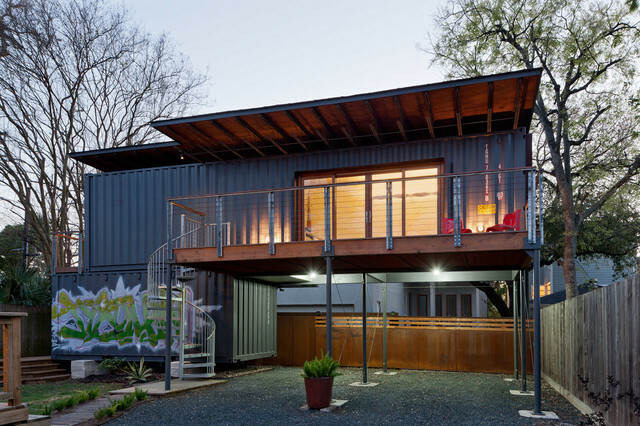 Oxford Shipping Container House - Houston, TX. Double slider - may be that we can nix one of the windows and just create one big opening.